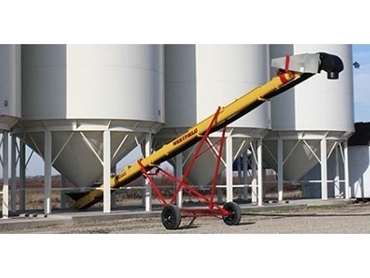 The WC 1335 top drive conveyor from Westfield is ideal for bin load out and handling delicate seeds and commodities. The conveyor features a capacity of up to 3,500 bu/hr or 72 tonnes per hour and has a collapsible hopper of 27’x38’ with a 10’ clearance. The 13” conveyor rubber belt is coupled with a nylon slider backing and alligator lacing for added endurance. The conveyor belt's poly deflector hood is durable and provides a great pillow for delicate seeds and commodities. The belt is easily adjusted and with a removable tow hitch allows for easy maneuverability during operation. With two different frame configurations, one for electric and one for hydraulic, hitch weights are kept to a minimum and the conveyor is handled easier.